Apple Valley Lake is 511 acres and averages 30 feet deep. It is amazingly crystal clear. Most lakes in central and north east Ohio average only 5-10ft. 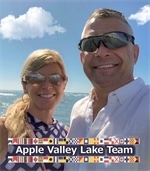 We have a full service marina with gas docks, three beaches, two club houses, a gorgeous 18 hole public golf course (adjacent - Apple Valley golf course not ownd by Apple valley), basketball, fitness center, indoor pool, outdoor pool, and more! The community amenities are private (restricted to property owners only).The common grounds are kept pristine! You will never be disappointed. Clubs: Apple Valley offers its property owners a variety of clubs to join. From dancing to fishing to getting active with jogging, pickle ball, golf and tennis. What a great way to get to know others with like interests and have fun! Spearmans: 26155 Coshocton Road Millwood, Ohio 43028 - 740-599-7617. You'll always feel comfortable and welcome here. This is where the locals go! Old fashioned and yummy! You'll expect" Flo" to wait on you! ALWAYS warm and friendly service. You wont need a menu - we suggest any of the daily specials on the white board. You wont be disappointed. Although they do not have a webpage,Google them, you'll see the 5 stars! The Howard Hilton Tavern: 23379 Coshocton Road Howard, Ohio 43028 -740-599-2337. Located downtown Howard. Yes, there is a downtown Howard, Ohio!! A super duper casual tavern. Kid friendly prior to 7pm. By far the best pretzel bun burgers in town! Stop in for Taco Tuesday night! Click here for Howard Hilton Website with menu, hours and events schedule.